As I walk around our neighborhood, I often find myself wondering about the people who have lived here since the second half of the nineteenth century, and I feel intensely curious about their distant lives. On the assumption that many of my neighbors must also share this fascination with the names and personalities of certain persons long dead, I am trying to gather on this blog a good deal of information about the former inhabitants of A Street SE (between Third and Sixth streets) on Capitol Hill, Washington, D.C. The emphasis is mainly on the people who lived on this street rather than the history of the buildings, though I am compiling any material that I can about the street’s past. There will also be some occasional notes about other addresses in the neighborhood, including of course St. Mark’s Church, which is at the corner of A and Third streets. The easiest way to find all the posts relating to a particular house is to click on one of the addresses in the dropdown menus under the header above and in the menu Addresses at the right. The tag cloud below it includes surnames, names of institutions, and a few broad categories like photos, deaths, and marriages. The search box at the upper right is useful for doing more miscellaneous kinds of searches. However, I have gradually become aware that by now so much material has accumulated on this blog that it is increasingly difficult to make any sense out of it. I have therefore decided, as an experiment, to open up my drafts and notes in OneNote Online, where you can see all the entries for an individual house at a glance, organized chronologically. OneNote also allows you to search within the text of the various newspaper clippings. I should add that searching is very slow in OneNote Online, so you will want to continue using the blog itself for most searches and to keep track of the latest posts. Here is the link to the OneNote notebook. I am grateful to several persons who have supplied material for this blog: Gene Berry, Peter Clark, Eric Freund, Mark Kantor, Paul Cromwell, and Maureen Shea. I welcome further suggestions and corrections. Postscript: A quick word about Boyd’s Directory, which is cited so frequently on this blog. In late 2013 I located fifteen annual editions of it online, downloaded them to my hard disk, and then, after searching for individual addresses, posted the results here. Gradually, however, I have gained access to many additional volumes of Boyd’s, and I have therefore found it necessary to bring the lists on this blog up to date from time to time. Since in the twentieth century Boyd’s included a “Street and Avenue Guide,” I have also clipped and uploaded the sections describing the 300, 400, and 500 blocks of A Street in many of those volumes (mainly supplied by Paul Cromwell) in a series of posts entitled “Residents of A Street in [year].” Finally, you should note that the OCR in all the Boyd’s volumes is imperfect; do not be puzzled, therefore, if John Doe appears at an address in 1905 and 1908 but not 1906 or 1907. He’s probably living there in the intervening years as well. Washington Herald, 31 October 1922, p. 10. Washington Herald, 10 November 1922, p. 2. Washington Evening Star, 30 July 1881, p. 2. Washington Post, 9 April 1881, p. 2. Original Owner — King, Chas. W.
Architect — King, Chas. W.
Builder — King, Chas. W.
Original Owner — Obold, F. S.
Architect — Obold, F. S.
Builder — Obold, F. S.
Original Owner — Bayne, J. W., Dr. Builder — Kirby (W. F.) & Bro. Original Owner — Bayne, J. W.
Builder — Prescott, S. J. 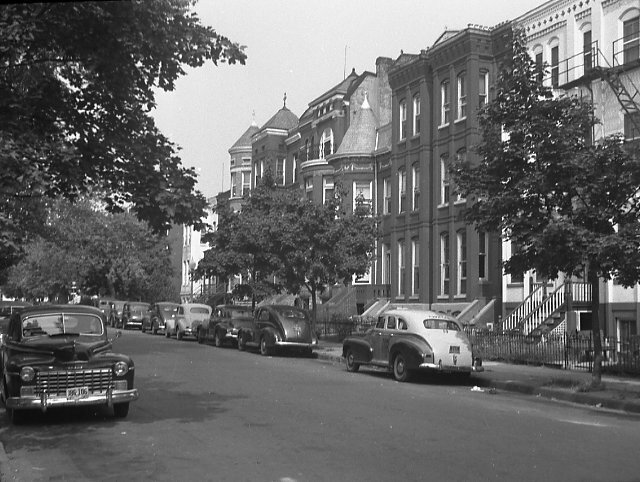 A Complete Set of Surveys and Plats of Properties in the City of Washington, District of Columbia. Compiled and Drawn from Official Records and Actual Surveys (Philadelphia: G. M. Hopkins & Co., 1887). The full book is available online from the DC Public Library. William H. Barry (gasfitter); George Emmerich (clerk, Post Office); John Maloney (laborer). George Emerich [sic] (clerk, city post office). Julius C. Shailer (2nd lieutenant). Gershom Bradford (assistant, Coast and Geodetic Survey). Gershom Bradford (assistant, Coast and Geodetic Survey); Mary A. F. Winsor (widow of Charles F. Winsor). Gershom Bradford (Coast and Geodetic Survey). Gershom Bradford (assistant, Coast and Geodetic Survey); Minnie G. Bradford. Jennie Beadle (widow of John H. Beadle); Mary E. Beadle (teacher). Jennie C. Beadle (widow of John H. Beadle); John B. Beadle (reclamation service); Mary E. Beadle (teacher). Jennie C. Beadle (widow of John H. Beadle); John B. Beadle (clerk); Mary E. Beadle (teacher). Jennie C. Beadle (widow of John H. Beadle); John B. Beadle (student); Mary E. Beadle (teacher); Elizabeth Hubbard (widow of Penrose H. Hubbard). Jennie C. Beadle (widow of John H. Beadle); John B. Beadle (clerk, boards); Mary E. Beadle (teacher, Madison School, boards). Jennie C. Beadle (widow of John H. Beadle); John B. Beadle (clerk); John H. Beadle (clerk, reel server); Mary E. Beadle (teacher, Madison School). Jennie C. Beadle (widow of John H. Beadle); Mary E. Beadle (teacher). Jennie C. Beadle (widow of John H. Beadle, teacher); Mary E. Beadle (teacher). Jennie C. Beadle (widow of John H. Beadle); Mary A. [sic] Beadle (teacher). Anthony B. Lamb; John M. Holusha. James H. Foster (laborer); Mary E. Foster (washing). J. J. Darby (Patent Office). Emma E. Cook (telephone operator); Clara M. Richter (clerk, post office). Clara M. Richter (clerk, post office). H. C. Carr (clerk, Treasury Department). Clara E. Reed (dressmaker); John Fisher (printer); W. E. Tew (letter carrier). Andrew Heard; Andrew J. Heird [sic] (inspector); Robert V. Rusk (clerk). Edward H. Litchfield; Millard F. Peake (furniture). Edward Litchfield (carpenter); Etta Tait (widow of Joseph Tait); William E. Gibson (clerk). Millard F. Peake (M. F. Peake & Co.). Frederick A. Linger (clerk); Jane Brown (domestic). Charles H. Seaton (Department of Agriculture). Edward N. Ashley (paperhanger); Fannie E. Ashley; Harley B. Ashley (carpenter); Henry M. Ashley (Washington Wall Paper Co.); Lewis W. Ashley (clerk). Edward N. Ashley (paperhanger); Harley B. Ashley (carpenter); Henry M. Ashley (paperhanger); Lewis N. Ashley (paperhanger). Edward N. Ashley (paperhanger); Harley B. Ashley (carpenter); Henry M. Ashley (paperhanger); Lewis W. Ashley (paperhanger). Torstein Jahr (Library of Congress) Mariana B. Fant (widow of Joseph N. Fant). Cora A. Weaver (milliner); Priscilla Weaver (widow of Samuel Weaver). Clarence Weaver (general agent, United States Casualty Co.); Cora A. Weaver (milliner); Leon Weaver (paperhanger); Priscilla Weaver (widow of Samuel Weaver). Cora B. [sic] Weaver (milliner). Cora A. Weaver (milliner); Priscilla Weaver (widow of Samuel Weaver); Leon Weaver (paperhanger). Cora Weaver (milliner); Leon Weaver (paperhanger); Priscilla Weaver (widow of Samuel Weaver). John W. Slater (elevator conductor); Peter Columbus (helper). Harriett E. Columbus (widow of Aristides Columbus). Harriett E. Columbus (widow of Aristides Columbus); Leo V. Columbus (machinist). Iva L. Kilby (clerk, Kann’s). Albert Barry (painter); Mary E. Booth.